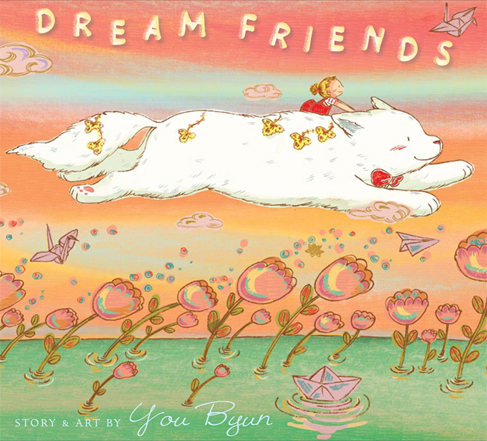 A couple of weeks ago I won a copy of debut author and illustrator You Byun's Dream Friends (Nancy Paulsen Books, 2013) in a Writer's Digest giveaway. In this charming picture book, Melody plays and goes on fantastic adventures with a special friend in her dreams, but she is too shy in real life to make friends. One lonely day on the playground, Melody dances as she remembers fun times with her dream friend, which catches the attention of the other kids and leads to new friendships. The bright pastel palette and the whimsical, textured illustrations complement the story perfectly. Q. Can you tell me briefly about your journey to publication? I always have loved anything with images and stories - like children's books! I studied Graphic Design in Hong-ik University in Korea and received an MFA in Illustration as Visual Essay at the School of Visual Arts in NYC. After graduating, I took Pat Cummings' Children's Book Boot Camp (CBBC), where I made a dummy book. I went to the SCBWI New York Conference in 2010, where I won the grand prize and portfolio prize. This led me to meet lots of great Art Directors. Eventually, the dummy book I made at CBBC ended up with my publisher Nancy Paulsen of Nancy Paulsen Books, An Imprint of Penguin Young Readers. It couldn't have been better since then – because it's so important to meet someone who knows and understands what you are trying to do! Q. What is the most surprising thing you learned in having your first book published? The most surprising part was how much time the team at my publisher put into a book. It blew my mind. It took about 2.5 years in total to see the book in bookstores. Q. How did that process roughly break down? Q. What was your illustration process for Dream Friends? Q. What is the one piece of advice you would give to aspiring picture book writers or illustrators? I am sure you already know what you are doing. So I would say, be out there all the time until you finally meet someone who likes your work. The key is to keep trying everything you can do. I have two books coming up, also with Nancy Paulsen Books, an Imprint of Penguin for Young Readers. I will be collaborating with a brilliant writer, Linda Ashman, for a book called Little Baby Buttercup, and I am making my own book which I will do both writing and illustrating. I am developing sketches and refining ideas at this point. I am so happy to work with the same team again. You Byun can be reached online on Facebook and Twitter, and check out her art prints or her website. I was so thrilled you won the book, Sylvia! Thank you both for sharing an enlightening behind-the-scenes look at You Byun's success and also thought process on this lovely book. The ethereal glow of the art is simply breath-taking! Thanks for sharing a little about your process You, those colors are marvelous. I love seeing the original and the finished work. Thanks Sylvia for writing this inspiring post. Thanks for the interview Sylvia and You. I always enjoy looking at sketches or the beginnings of the book and the story behind it. Great Interview, Sylvia and You Byun! I enjoyed finding out more about You and the process. What a wonderful, inspiring success story! Thanks, Sylvia. Nice interview, and a lovely book!